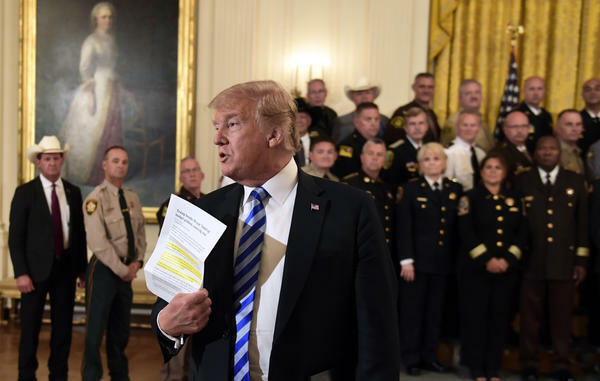 President Trump responds to a reporter's question during an event with sheriffs in the East Room of the White House on Wednesday. The Times said revealing the author's identity would put his or her job in jeopardy. The Times declined NPR's request for an interview with an editor about its decision. In the column, the author presents a damning assessment of the Trump presidency and suggests there is a network of officials working behind the scenes to protect the nation from Trump. "We believe our first duty is to this country, and the president continues to act in a manner that is detrimental to the health of our republic," the author wrote. The op-ed described Trump's leadership style as "impetuous, adversarial, petty and ineffective." Trump responded to the op-ed in a previously scheduled White House meeting with sheriffs from across the country. He said the author is "failing" and "probably here for all the wrong reasons." Trump responded to the op-ed in the same way the White House has been responding to the damning new book by Bob Woodward: by outlining his administration's accomplishments and touting the strength of the economy. Trump is doing so well, in fact, that he is already confident that he'll be re-elected. "Nobody's going to come even close to beating me in 2020, because of what we've done," Trump said. White House press secretary Sarah Sanders, in a separate statement, called the anonymous author a "coward" who should resign. The author of the column argued that the successes of the current administration on issues like deregulation and tax overhaul have happened despite the president's management style. Calling it a "two-track" presidency, the author said Trump works on his own agenda, while others in the administration take actions they believe are in the best interest of the country. One example was the decision to expel Russian diplomats from the United States after the poisoning of a former Russian spy in Britain. The author said Trump was reluctant to take the action, but "his national security team knew better." The column appeared as the White House already was fighting leaked details from the forthcoming Woodward book, Fear, that describes a dysfunctional White House in which the president is not respected by his staff and in which aides sometimes take clandestine action to keep the president from acting in ways that hurt the country. In one example, former chief economic adviser Gary Cohn reportedly took a letter off Trump's desk to keep him from signing it because Cohn feared the consequences for the U.S. position in Asia. Trump called Woodward's book "total fiction," and Defense Secretary James Mattis and White House Chief of Staff John Kelly have denied that they bashed the president.